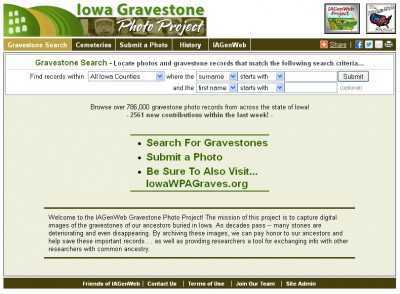 A site that’s different and that can actually turn out to be very useful, the Iowa Gravestone Photo Project (IAGenWeb) gives people from all over the world a ready chance to locate photos and gravestone records in Iowa. On the project’s website (www.iowagravestones.org) you can find records by name and by surname, and also search for the gravestones that go with these records. The site currently covers the whole State, and more than 786,000 gravestone photo records are indexed. All these photos have actually been submitted by users of the site, and if you want to make a contribution of your very own then these are the submission guidelines to keep in mind. But just to make it short: accepted image formats include JPEG, GIF and PNG, photos should focus on the gravestones themselves and they shouldn’t be larger than 1MB. 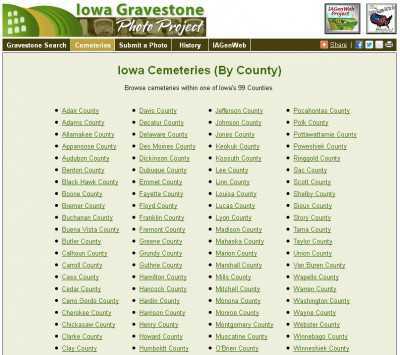 And the site also features a full database of Iowa cemeteries. All 99 Counties are taken into account – check it out here. In the end, the importance of a site like this one is easily understood. As time goes by, gravestones deteriorate more and more. Eventually, some become completely illegible. By letting Iowa residents store everything online like this, the site ensures that the resting place of their ancestors would never be forgotten. Not to mention that it makes the work of genealogy researchers a lot easier. IowaGravestones.org is a superb tool for exchanging reliable information, and finding common ancestries online.